I am more or less of a new-ish convert to the beauty, flavor, scent, and health properties of quality coconut oil. I say “quality” because I have had some pretty inedible coconut oils. I won’t say the brand and coconut oil making don’t matter. And since coconut oil is expensive, why buy something you’re only going to throw away (believe me, I’ve had to do that before). Coconut oils are healthy and versatile. Add a long, stable shelf life (2-3 years) and no need for refrigeration, and now you know why I like coconut oil. 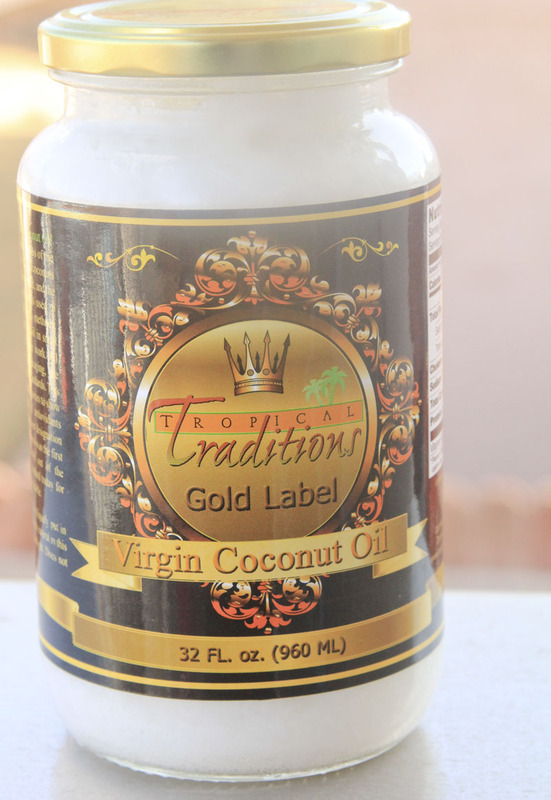 Tropical Traditions Gold Label Virgin Coconut Oil is my new favorite. Made from organic, fresh coconuts in rural areas of the Philippines, to earn the Gold Label Standard designation, Tropical Traditions repeatedly tests its products in an independent laboratory analysis to make sure it has the highest amounts of antioxidants available in Virgin Coconut Oil. And since they’ve made coconut oil for over 10 years, they know that the time-honored tradition of using the wet-milling process of extracting the oil from fresh coconuts is the best way to produce a quality coconut oil. Containing only 117 calories per Tablespoon, each nutrient-dense serving is 0 carbohydrates, perfect for low-carbohydrate diets. It’s terrific! In fact, when I’m not rubbing it into my skin, I’m using it to make some of my more recent recipes, like my recent Coconut Buttercream Frosting. How about a my favorite benefit of coconut oil, aside from how phenomenal it tastes? Moisturizer: Whether dealing with dry scalp or parched, thirsty skin, coconut oil is a mild, natural moisturizer. I’ve even taken to using coconut oil on my skin as a natural moisturizer (forehead frown lines are a bummer). Thankfully, with Tropical Traditions Gold Label Virgin Coconut Oil, no frown lines shall be had on my face. Because of its quality, flavor, shelf stability, and skin care properties, this product is definitely worth its weight in Gold Label. Price: $29.50 for a 32 ounce glass jar (roughly 62 1 Tbsp servings), $75.00 for a gallon. Perfect for: Sauteing or in place of lard in recipes. Love: The taste of this product right out of the jar. Negative: I wish I could find this locally in stores. Disclosure: Tropical Traditions has provided this product free of charge for review, but this has not affected my review of the item. I love Tropical Traditions Gold Label. I actually bought it in the gallon size during one of the great sales. Highly recommend! Yeah, too bad it’s SO expensive, and that’s without shipping! I buy Nutiva from Netrition. I bought some raw Nutiva from there once, sold in half-gallon GLASS jars… best virgin coconut oil I’ve ever had. I love applying a bit to the dry ends of my hair a couple hours before washing it. It helps! I also have started making my own low-carb chocolate bars with it as well. I melt 1/2 cup coconut oil, and 2 T. grass-fed butter (you could use all coconut oil and it will work), add 2 T. cocoa powder, a full dropper full of stevia and 2-3 drops liquid sucrulose. (to taste)That’s the base. For just plain chocolate bars you’re finished. I like to add goodies to it. I add some chopped pistachios, cayenne pepper!! (yum!) chia seeds, hemp seeds, a Tablespoon of any nut butter, and a handful of dried unsweetened coconut. I spread it into a toaster oven sized pan lined with parchment paper, (though I think it may easily pop out of the pan without using it) Freeze for 30 minutes, score, break into pieces and put the pieces into a container in the fridge. I will never have to buy another chocolate bar in my life and it uses the sweeteners that work for me, no bitterness. Yay! Love, love, LOVE this stuff! I even got the pet version for my dogs and they love their daily treat. Just a heads up for anyone not feeling the prices – Tropical Traditions has sales quite often. Buy one, get ones… percents off… That’s how I get mine. 🙂 Thanks for the review, Jaime! I love, love this stuff! My sister in law takes a tsp per day just plain!! It has worked on tons of things for us here at our home! Pretty good pricing for what it does in your life! I’d like to try it in a low carb truffle recipe…looks like I need to order some! Until I saw your review, I thought all oils must taste the same. I’ll have to give it a try. Is there a difference between coconut cream and cocnut oil? Hi, Liz. I think coconut cream is the thicker part of coconut milk. I hear it is heavenly! I followed the steps to enter and would love to win! I’ve bought some at the store before but it probably wasn’t as high quality. Liked their Facebook page for an extra entry! Thanks!!! I want to try this, I have tried some of the wonderful recipes on your site all of them are wonderful. I am hoping to win. I have really enjoyed coconut oil in my baking as an alternative to butter. Makes everything very moist. Would love to try the coconut oil and all the positive remarks is pushing me into the order mode soon. Will hopefully get to try it through your offer. Love your website. I LOVE quality coconut oil, it is very different from the cheap stuff! I need to try their coconut cream, as I’m assuming it’s heavenly! Oh, I also read your review and Liked their FB page. It looks like they have a ton of cool products. I had no idea they made skin care products. Too cool! I’ve used coconut oil for cooking for awhile, but never thought of using it as a way to get rid of frown lines…I will try it! I love your site. I read your review and have signed up at Tropical Traditions website. I have used coconut oil for awhile. I am going to try Tropical Traditions coconut oil as soon as I finish what I have. Am looking forward to trying the different processed coconut oil. I love coconut oil for cooking, I have not tried many beauty tips yet – thanks for the ideas! I’ve used coconut oil in baking and cooking but have never used it as a moisturizer. I’d like to try that. Love the tropical traditions virgin coconut oil. Buy it by the gallon. Now I may have a chance to get some for free, yaaaaaaah, since I’m qualified. Thank you for a great site, love your recipes. I too am a new extra virgin coconut oil user. I have found that it tastes great, and really does help soften my overly dry skin. I am hoping that it has some positive effect on lowering my sugar levels as well. Thanks for the great giveaway! Been using it for skin & in recipes for over a year! Love it! Always looking out for a really good coconut oil! I went to their site and subscribed 🙂 I’m qualified to enter! I so want to try this!! I definitely look forward to checking out their products when my current supply of coconut oil is depleted! I use virgin coconut oil in my coffee in the morning. For a quality oil its important to have ‘virgin’ on the label, it retains all the nutrients. I tried applying coconut oil on the face in the past and after around 3 weeks, I started getting spots. I may have applied too much.